The California Golden Bears battled before losing against No. 14 Stanford on the road, 74-69. Cal went toe to toe with No. 14 Stanford for nearly three quarters, fell down big at the start of the fourth, and then made a furious comeback to close the game, only to run out of time. Asha Thomas continued her recent strong play, leading the Bears with 20 points. Mikayla Cowling had 14, while leading scorer Kristine Anigwe struggled, going one for seven from the field in 23 minutes. The Bears had no answers for Kiana Williams, who had five threes and 26 points. “It’s a big-time performance by a freshman in a big-time game,” said Gottlieb of Williams. 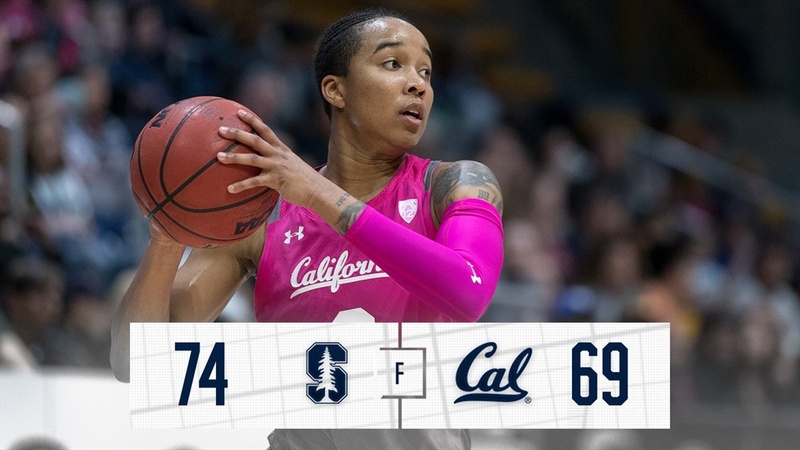 Brittany McPhee had a poor shooting night (5 of 20) but still contributed 17 points, while Nadia Fingall had 10 off the bench, including two big jumpers in Stanford’s decisive 11-0 run that bridged the third and fourth quarters. Cal is now 17-9 and 8-7 in the Pac-12. Stanford is 19-8, 13-2. Stanford opened the game on fire, hitting six of seven shots. The Bears, in the meantime, missed nine of 10 shots, and the Cardinal raced out to a 14-3 lead. Alanna Smith contributed six baskets in the run. Kristine Anigwe made two free-throws, and Jaelyn Brown pulled up for the midrange to get Cal back into the game. Mikayla Cowling hit a three, and Brown knocked down a free-throw, pulling Cal within 20-13. But Kaylee Johnson’s putback closed the quarter for Stanford, with the Cardinal up 22-13. Asha Thomas made a three to open the second, as the Bears looked to attack. Cowling hit a runner off glass, then Davidson and Brown got to the line, knocking down one free-throw each. Brown’s three completed the 10-5 run, and Cal was within 27-23. In the run, the Bears also forced a second personal on Alanna Smith, who went to the bench. CJ West flashed strong to the basket as was fouled. Her two free throws got the Bears within a basket, and Asha Thomas converted a Cowling steal into a fastbreak basket, tying the game at 29. The Bear comeback happened all while Anigwe was on the bench. “We just got in a flow with the group that was out there,” said Gottlieb. West put Cal in the lead with a score down low, and Thomas hit another drive, falling way, and the Bears were up 35-32. Kiana Williams helped Stanford keep pace with two treys in the quarter. Her two free-throws got Stanford within 35-34. The Bears had the chance to build on their momentum, as Thomas stole the ball from Johnson underneath the Cal basket, but her putback just rolled out. Instead, Stanford raced to the other end, and 6’5 Shannon Coffee hit a three at the buzzer, and Stanford entered intermission up 37-35. Williams had 14 at the half for Stanford, while Cal was led by Thomas’s 10. Brittany McPhee and Mikayla Cowling went at each other to open the third. McPhee hit a three. Cowling made a pull up in the lane, and then a corner three, tying the game at 40. McPhee responded with a drive. With the score knotted at 44, McPhee missed a long three, but Nadia Fingall grabbed the offensive board and made the putback. On the play, Penina Davidson picked up her fourth foul; Davidson had led the Bears with six rebounds up to that point. Fingall completed the three-point play, and Stanford was up 47-44 at the 4:33 mark. The Bears continued to pile up fouls, and their fifth infraction of the period sent McPhee to the line. She hit one. Cowling attacked on early offense and got to the line. She hit one, but the Bears gained possession on the miss second attempt and Anigwe scored to pull Cal within 48-47. Williams hit a baseline jumper, and Anigwe responded with two free-throws. Stanford again executed at the end of the period. After two McPhee free throws, the Cardinal ran two plays for Fingall, and the sophomore made them pay off, hitting a three and a midrange jumper. The 7-0 Cardinal run put Stanford up 57-49. “We just do a great job of closing quarters,” said Williams. Cal opened the fourth with a turnover, and Williams streaked down court hitting the shot through the foul. The frosh completed the three point play, and Stanford got back up by double digits, 60-49. Williams continued to take over the game, forcing a held ball turnover and then hitting a three. Stanford continued to roll. With both Davidson and Anigwe in foul trouble, Johnson easily grabbed the offensive rebound and put the ball in. What had been a tight game was turning into a rout. Nothing seemed to go right for the Bears. Even when the Bears had good position down low, the ball rolled off the rim. But Cal had one more push. West completed a three-point play to pull Cal within 66-55 with 2:45 to play. Two Anigwe free-throws got the game within single digits. Thomas hit a three to shave another point off the lead. After the Bear defense held, Cal found Anigwe in the paint, and the junior got fouled. Anigwe hit one, and Cal was within seven, 68-61. A three by Cowling, and Cal was within 71-66, with 21.3 seconds to play. Thomas hit another three to close it within four (73-69), but the Bears ran out of time, as Williams completed her great night with another free-throw to close out the game.